Brenda made a transformation in her life. 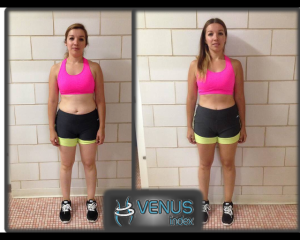 Through the Venus program she learned how easy it is to use various health issues as an excuse. No matter what the adversity, it still always comes down to the amount of food we consume. It’s kind of like we don’t want to face the elephant in the room. It does not seem fair. I have been over weight pretty much my entire life. I have previously dropped 87lbs, and maintained for about five years. However, over the last two years it has slowly crept up 10 pounds a year, even with an active attempt by me trying to lose weight. 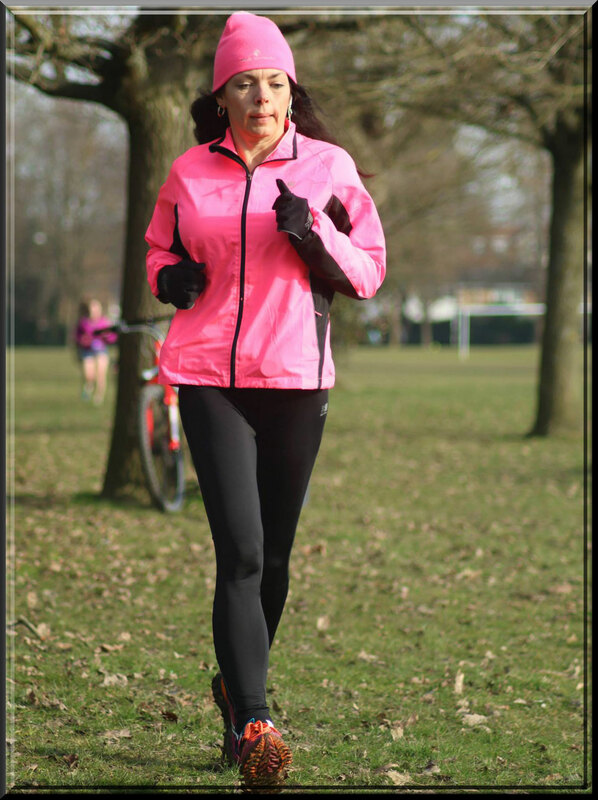 I had been keeping up my exercise routine, six days a week, mainly cardio, with some weights, as well as my diet routine, just as before. Although my diet was not consistent, when I was having difficulty loosing I started taking the advice of others, like “you’re not eating enough”, which by their standards I probably was not, but eating less…eating more nothing was working. I was also diagnosed 2 ½ years ago with a chronic medical condition which requires a daily medicine. I blamed the gain and inability to lose weight on the meds as it was the only thing that had really changed in my life. 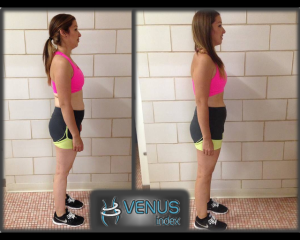 I purchased the Venus program about a year before and Loved the workouts; however, I kind of skimmed the nutrition portion. At some point I decided to check in with the forum and it became apparent the Veteran Venus’ would not let the meds be an excuse, and it appeared nutrition was the key. So I decided to put Venus to the test, this time trying the nutrition and weight lifting together. Low and behold the last year of weight gain was taken off in these 12 weeks, and my clothes fit again! I may have not lost a large amount of weight in the 12 weeks, and will keep going to drop the remaining pounds, but I consider this a win in a big way. I not only didn’t gain, but I lost which is something I was unable to do for two years. If you work the whole program it will work for you! 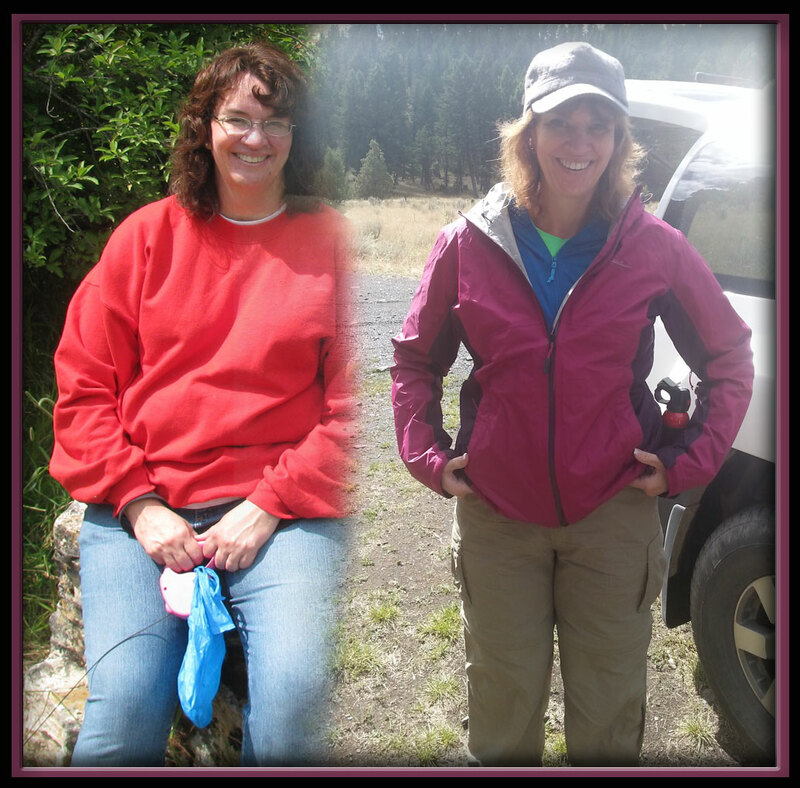 Brenda loves the outdoors and being healthier now! I have been on this journey for a very long time. I have always been overweight, but it peaked in April 2010. 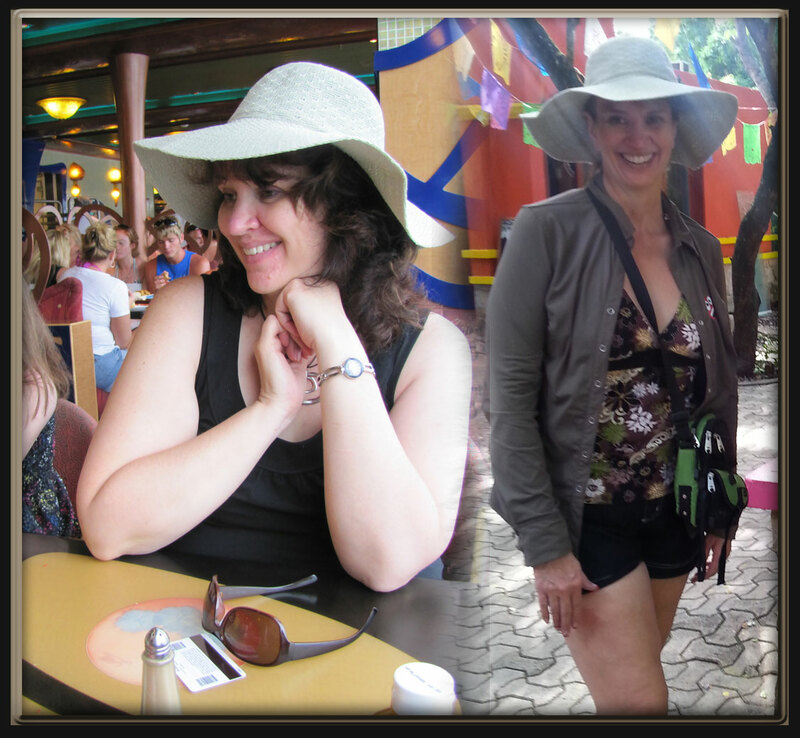 After seeing the pictures from our family cruise I put a stop to it and lost 90lbs by January 2011. I did this through hard work using another program and cardio, lots of cardio. I have maintained the weight within 20lbs for the last five years. However, four years ago I was going through a divorce; lost my dad and my hero. Four months later I was diagnosed with MS. I immediately started treatment,which consisted of daily shots. Initially, I was angry because I had just got my life back health wise, and now the threat of losing my mobility was real. 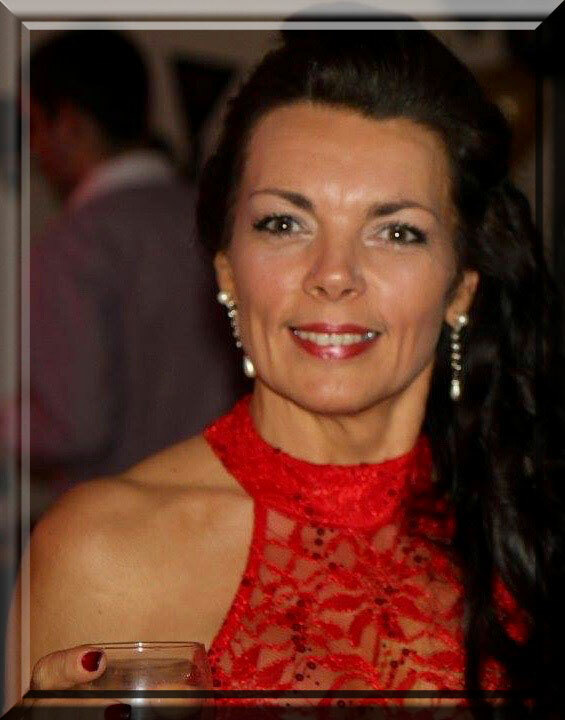 My attitude adjusted very quickly and I said “No, I got my health back so I would have the strength to fight this disease.” As luck would have it though I started slowly gaining weight consistently over the last two years about 10lbs each Dr. visit. I blamed the new medicine, although that side effect was not listed, what else could it possibly be? I was panicking with the weight creeping. I was trying everything adding weights, eating less, eating more, upping the cardio you name I was trying it. Here steps in the ladies in the Venus forum, and the podcasts. I didn’t write or ask questions just went through the forum regarding medications. I learned very quickly a lot of these ladies were on medications, and they would not let that be used as an excuse. Roberta described her battles with medications, she and the others preached it’s the calories period. I found this to be a no nonsense group, but the most supportive group I have seen. I have been in other groups, and they can get petty or have poor me parties. These ladies are not perfect, but the difference is they taken ownership and get back to business. 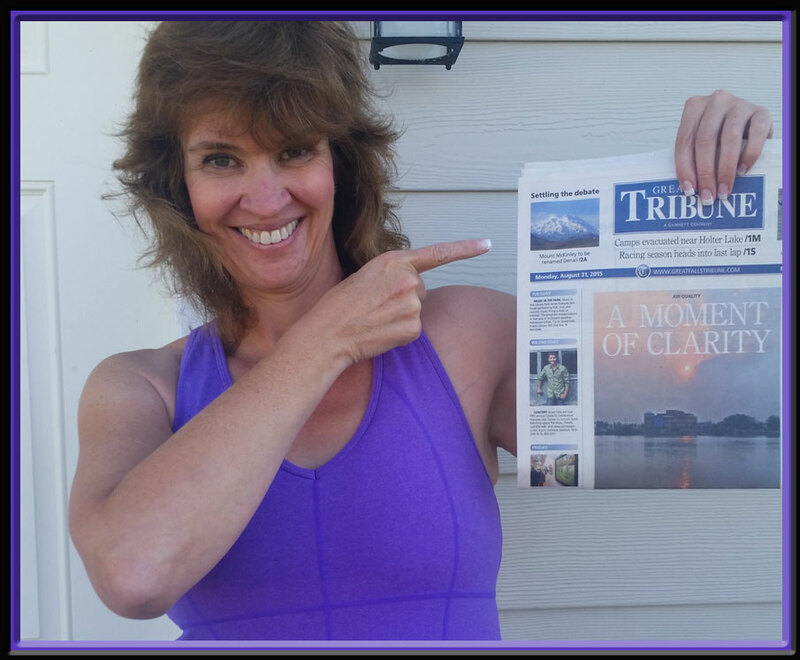 It is an inspiring group to say the least, and one I am happily a participant in now. I had bought the program about a year ago and started the workouts, which I loved, but still not losing the weight. The forum was claiming the diet was the key so I started the competition with the 12 week nutrition program, just to see if anything really happens in 12 weeks. It worked, I could feel it, but still didn’t believe it showed. I submitted my final pictures, and was pleased to see the difference 12 weeks makes. It is still not rapid for me, but the scale is lower than it has been in a year so that is a big win in my book!! The workouts have completely changed my shape which makes me smile. I was not happy with my shape even with the prior weight loss, and honestly I was floundering with my weight lifting programs. Truthfully I’m not working out half as much as I was with all the cardio. 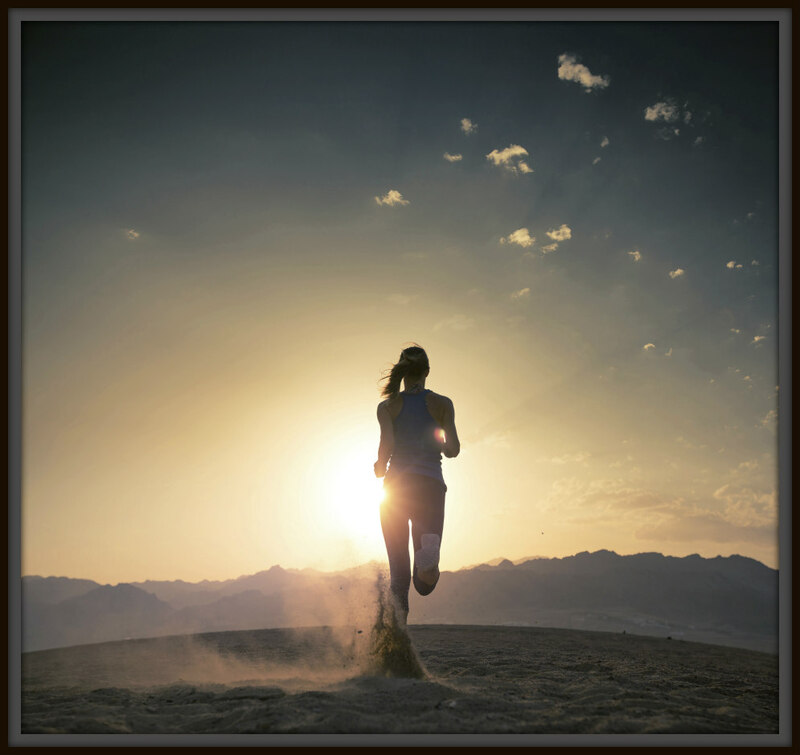 Venus works, it is a nutrition and workout program that just makes sense. I feel the other programs are starter programs, Venus is for when you mature and take responsibility to live your best life, by the controlling stumble forward. Thanks for the wonderful program John and Brad,and thanks to all those wonderful ladies in the forum. I love Brenda’s smile and her Moment of Clarity! 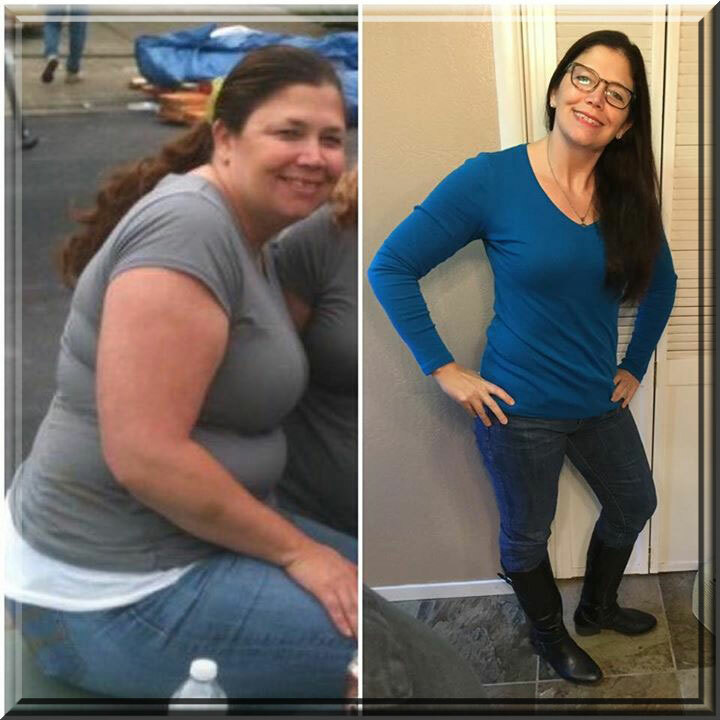 Heather at one of her heaviest weights before finding Venus and after, WOW! 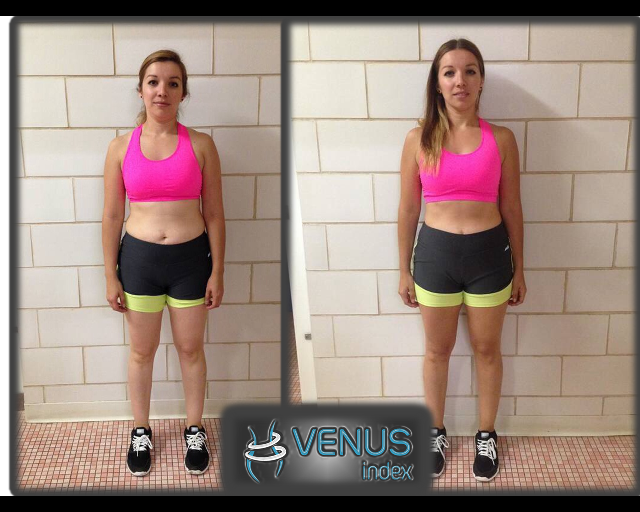 Heather placed in our recent VT15 Venus Transformation Contest. 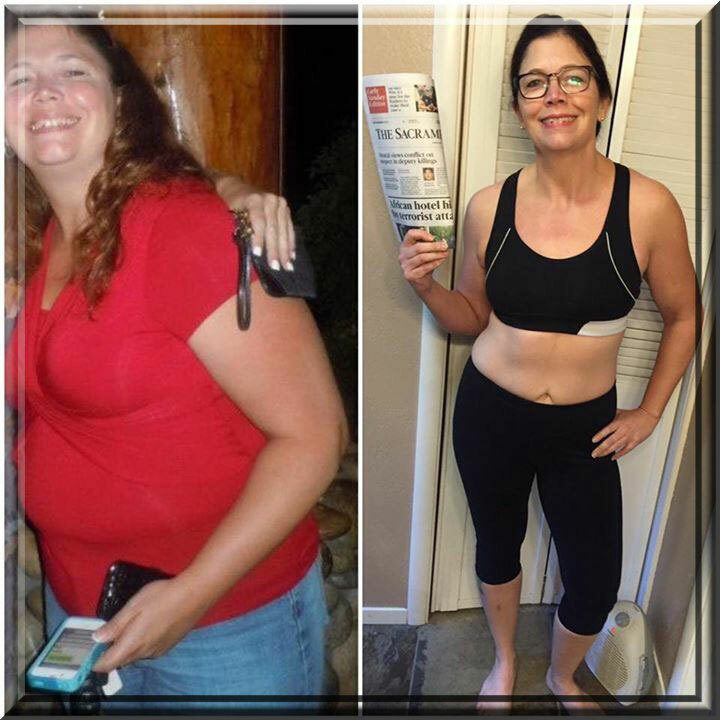 She did a phenomenal job and her results display the hard work she put in. 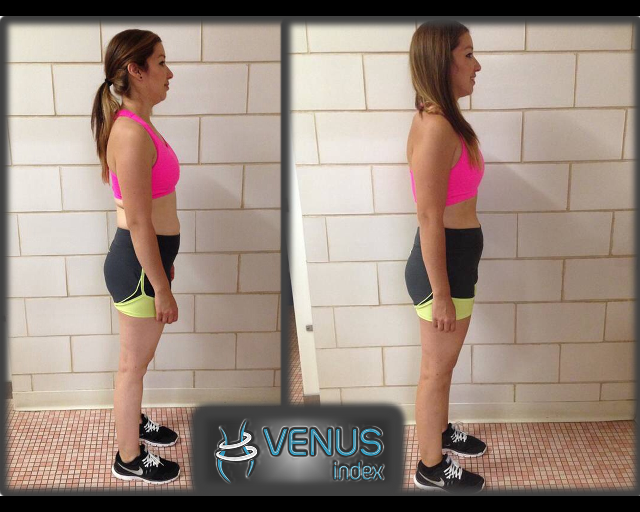 Her transformation stretches out further than this 12 week period though, she has lost over 30 lbs using Venus! 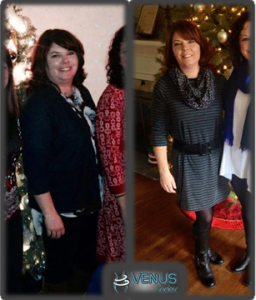 Heather before starting Venus in 2015 and after this 12 week contest, unbelievable! My experience with Venus has been amazing. My life long search for the program that works is finally over. I have found it and I am hooked. I am a 47 year old woman with a wonderful husband and 4 terrific grown children. However I was struggling with self-image problems, low self-esteem and was just unhappy inside. Like many other Venus ladies, I tried every diet program out there, and purchased several exercise DVD programs. I was successful in my goal of losing weight but as soon as I hit a certain point the motivation to stick with it disappeared and the weight started to climb back up. I had convinced myself that I was just meant to be overweight and my genetic chemistry was preventing me from being slim. Then in March of 2015 I found Venus on Facebook. I listened to John’s story about his sister and how he developed something that was specific to women who battle with this issue. 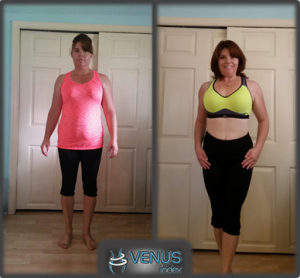 In my first 12 weeks on Venus I lost 20 pounds and 24 inches off my body. One thing I had never done in previous weight loss efforts was to combine the diet and the lifting. I had done both separately thinking it was enough by itself. The other aspect of Venus that was hugely motivating for me was the all the information I got through the podcasts and blog posts. I love, love, love John and Brad’s podcasts. I listened to them whenever I could. They blasted away every myth I grew up believing, every misconception that I had adopted just because a fitness professional said it and I was finally able to break away from all the bad information that I had stored in my head and replaced with the facts that John and Brad’s research had taught me. So after my first 12 weeks of the Venus program, it was May and summer was coming. I decided that I would take a break from actively losing, and applied the same principles of the program but eat at maintenance most days and at a deficit 2 days each week. As August approached I had maintained my 20 pound weight loss. I was ecstatic. I had never ever done that. In the past as soon as I stopped following the weight loss program, instantly the weight started creeping back up. This was when I decided that I would enter the contest to further motivate me to continue my journey. Here I am today at the end of the contest and I am more motivated than ever to continue my journey to get to my ideal Venus Body. I am not there yet but I am loving my new body, my new outlook on life, my new self-confidence. 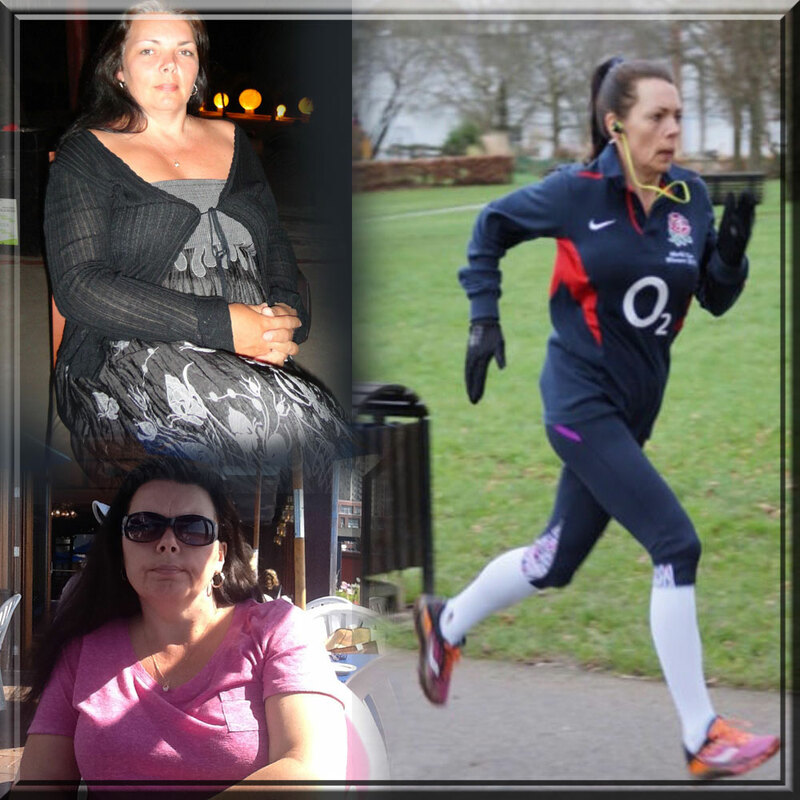 Not just my body changed, but my life changed…and people have noticed. 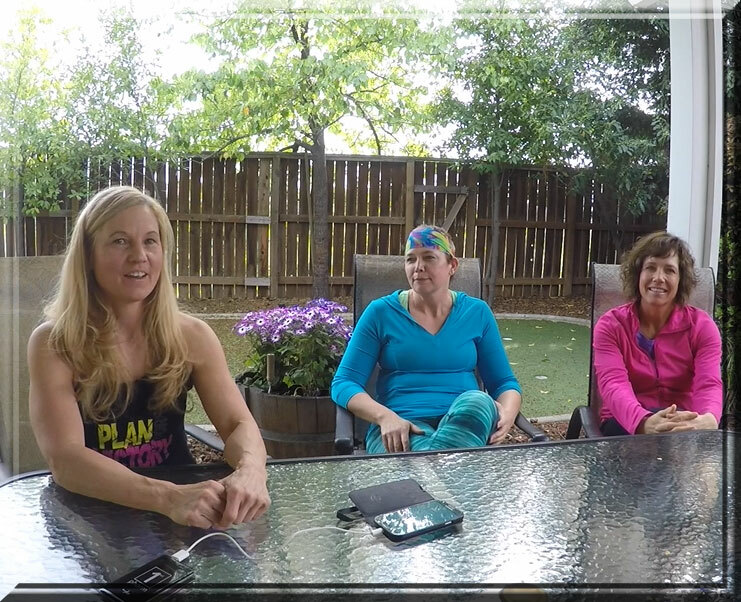 This journey has been amazing and I am so grateful for John, Brad, Liss, and Roberta and all the ladies on the forum for their constant efforts to encourage us, educate us and provide effective tools for every woman to utilize in reaching their fitness goals. Thank you all. Heather is a beautiful Venus! Nothing can stop her now! 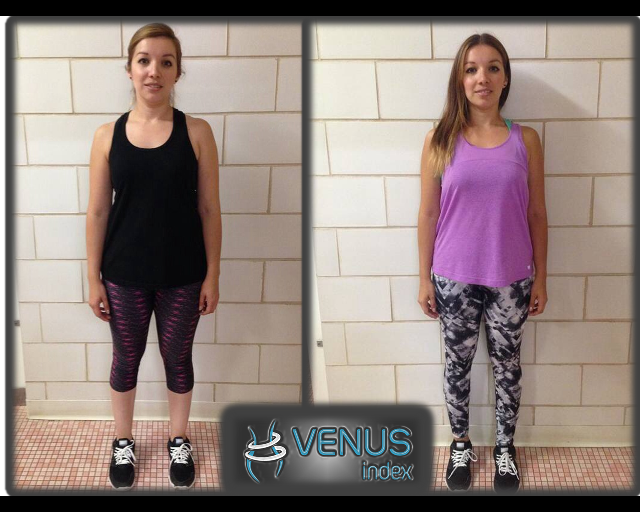 Laura placed in our recent VT14 Venus Transformation Contest. She did a phenomenal job and her results display the hard work she put in. 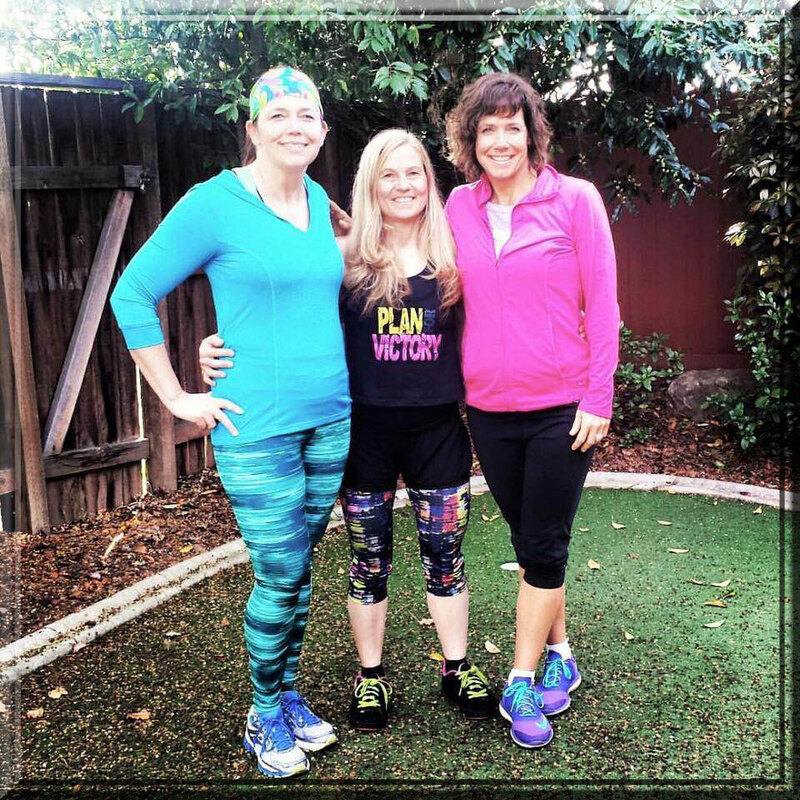 In 12 short weeks, she transformed losing 10 pounds of fat and 1.5″ from her waist! 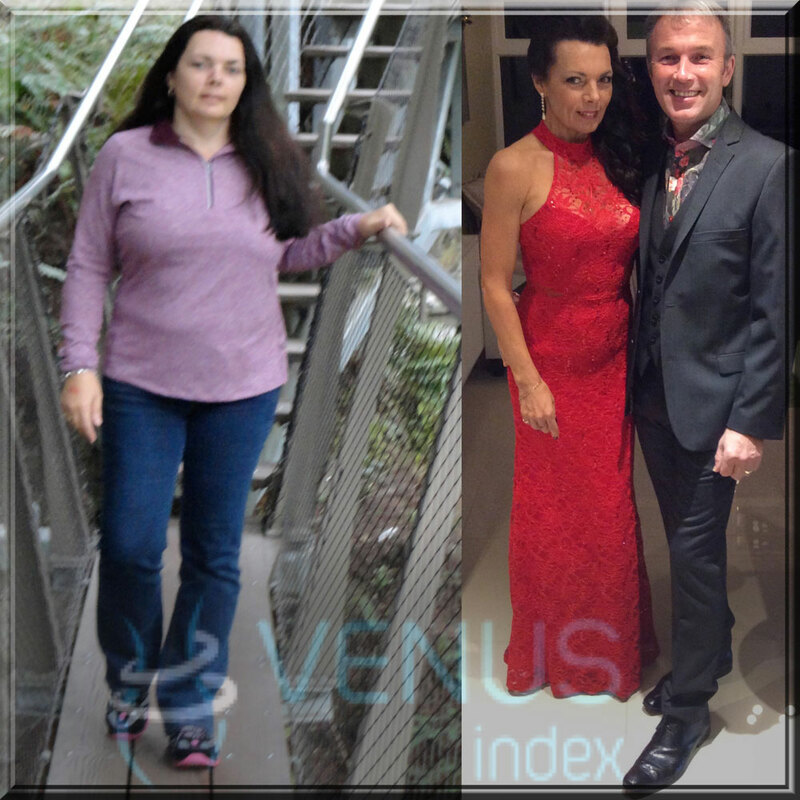 Laura before Venus and 12 short weeks after! WOW! I’m a wife and a full time home mother of two little ones. 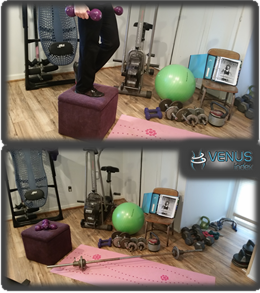 I started to join the Venus work out class not to long ago because I was trying to find the work out class that I like in all the aspects. In a short time started to love it! Later our Venus instructor told me about to join the challenge and I thought it was not for me and I said to many excuses to myself but I decided to join. I made it trough and I gain so much more than I though. I might not did my full goals but I gain more confidence in my self and more self-steem. I’m so glad that I did it and I definitely will go for more. 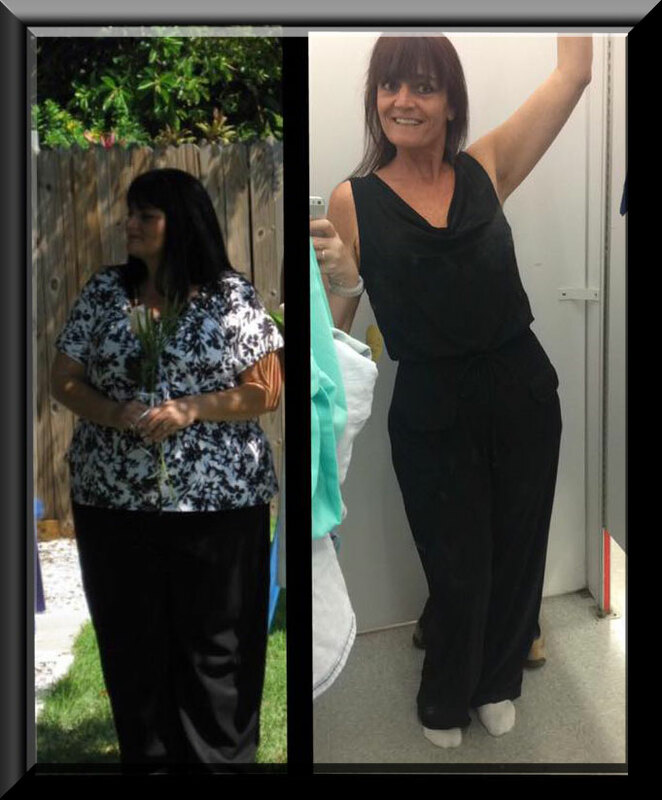 Laura made a transformation in 12 short weeks, but she did almost not take the final pics to submit. She did not think she had changed that much! Listen to her podcast at the bottom for more details and her exciting news! Listen to Laura’s podcast interview with Coach Liss below or download to listen later.